Heidegger had studied at the University of Freiburg. 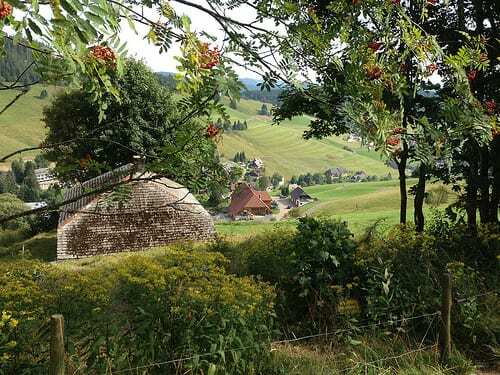 The city lies at the western edge of the southern Black Forest, a few miles from the Rhine and the French border. After the First World War, Heidegger worked as an assistant to Edmund Husserl, the phenomenologist, whom Hannah Arendt would later accuse Heidegger, her lover and National Socialist party member, of murdering. That’s all in the future. In 1917 Heidegger married, and Elfride’s dowry was spent on a plot of land in the hills around the ski resort town of Todtnauberg. The couple, with a young family, occupied the hut in August 1922. So began a period of great intellectual productivity. Heidegger took up a professorship at Marburg in 1923 and returned to Freiburg, on Husserl’s retirement, in 1927. Apart from a brief post-war absence, for denazification, Freiburg was Heidegger’s institutional house. But his home was in the Black Forest hills. Throughout, while on campus he lectured and supervised a stellar array of students, including Arendt, Hans-Georg Gadamer, Leo Strauss and Herbert Marcuse, Heidegger would return to his hut to live and think. Martin Heidegger dressed for the part. When he left the city behind, with its university, cathedral and offices, the philosopher would don rustic clothes. 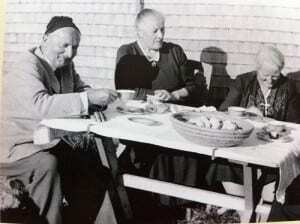 Here’s a picture, where we can see Heidegger dressing down, comfortable playing the role of honest, simple farmer. When he left Todtnauberg to commute to work he put back the professorial garb. Todtnauberg attracts skiers in the winter and hikers in the summer. 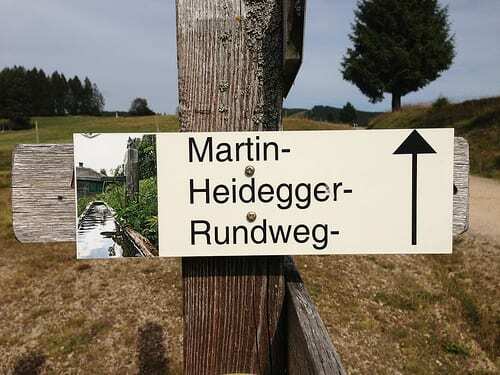 The town is proud of its humble philosopher-celebrity and has thoughtfully mapped out a guided walk, the “Martin Heidegger Panorama-Rundweg”, which takes you around the surrounding countryside and past Heidegger’s hut. There’s a pamphlet that can be picked from the tourist office, with text in English and German. Oddly, along the Rundweg, there are a series of enormous chairs, artworks that make for uncomfortable sitting. But mostly the impression is, as the pamphlet title suggests, panoramic: a picturesque vista of hills capped with beech and conifers. Halfway along a small farm road dives to the right, and there is Heidegger’s humble abode. The picture does not really give you the sense of just how small the hut is. It is one storey and the roof would end below my eye level if I stood against the wall. Heidegger might have moved in for the peace and quiet but I can’t imagine family life being quite so tranquil. Perhaps the children were told to play outside. 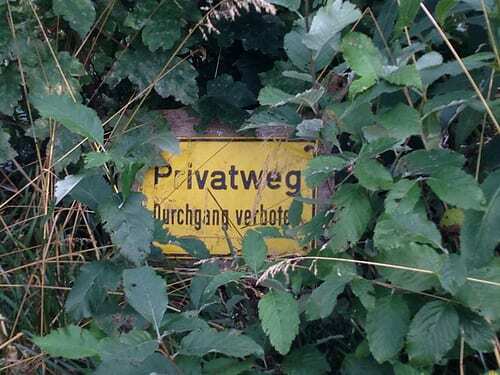 The building is private property – indeed it apparently belongs to the descendants – and a discreet notice on the final path warns us that getting any closer is verboten. From the hut’s simple outer appearance can be drawn conclusions to the inner appearance: the spare furnishing is still unchanged. The most modern thing in the hut is a little radio which bought Heidegger in 1962 for listening the news about the Cuba-Crisis. They got spring water from a near well. During the first years they got no electricity. In 1931 they got an electric connection. Apparently when Martin received an offer to go to Berlin, Elfride took the opportunity to bargain with the Baden government that, in return, her hut should be connected to an electricity supply. Martin, one presumes reluctantly, accepted the modernisation, even though he stayed in post in Freiburg. Now, of course, from an STS point of view, this attitude to technology is perhaps the most interesting aspect of seeing how Heidegger lived. When Heidegger was allowed to teach again after the Second World War, one of his first and most famous lectures concerned “The question of technology”. It is one of the foundational texts of the philosophy of technology, and requires some effort to follow. A conservative, Heidegger held a view, shared by many, that the human relationship to the environment had been impoverished by industrialisation. The lecture expressed intense disgust, for example, with the canalisation of the wild Rhine, and lingered over pre-industrial authentic, artisanal worked objects. 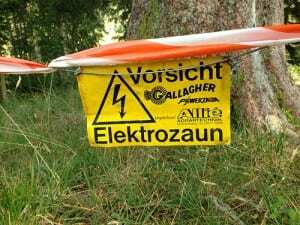 Heidegger’s profound point was to go beyond merely the observation that we treat our environment in increasingly instrumental terms – as means to ends – and argue that we should wonder why nature has this uncanny affordance to us at all. Nature, he says, has been framed so as to offer us means, and there are other ways we can, and should, relate and live. On the surface this argument seems to reflect, naturally, the philosopher’s chosen lifestyle: the simple abode, the rustic friendships, and the late admission of modern technologies – electricity for the wife, and a radio only at a moment of a threat of global apocalypse. 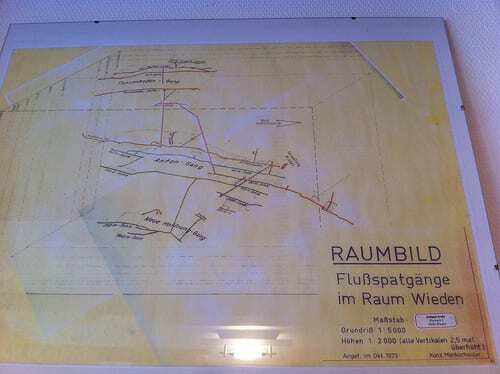 The map shows the land underneath Heidegger’s feet. There are mine shafts in all directions. 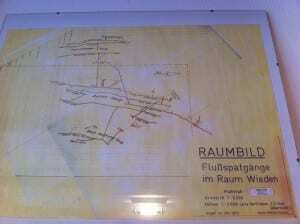 Extraction of ores made this part of the southern Black Forest a highly industrial area. Means to many ends. While the philosopher, dressed as a farmer, sat outside his humble hut admiring the view, thinking his thoughts, below men and machines worked hard together.